It is now official an anime pilgrimage guidebook has finally been written. Anime pilgrimages has become a big thing in Japan in the past few years, with anime fans visiting real places which have been featured in many anime and manga series. Now to make those fans life easier The Pilgrimage Integrity Committee released last December the "Anime Tanbou Seichi Junrei Guide" literally meaning anime exploration and pilgrimage guide, including pictures of all the hot spots around Japan, and also which series the spot appeared on. So if you ever wanted to visit the Washinomiya Shrine featured in Lucky☆Star or the city in Saitama, Chichibu where AnoHana takes place, this is the book for you. 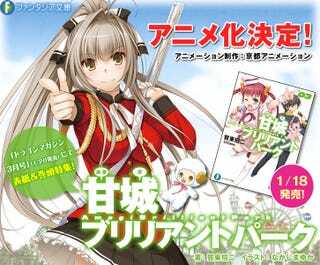 Kadokawa's Fantasia Bunko imprint announced on Wednesday that an anime adaptation of the Amagi Brilliant Park light novel series by Shoji Gatoh (Full Metal Panic!) with illustrations by Yuka Nakajima (Papa Kiki!) has been green-lit. Kyoto Animation will be producing the Anime!!. The "slapstick drama" begins with Seiya Kanie, a high school boy who is invited on a date in an amusement park by a mysterious beautiful transfer student named Isuzu Sento. He is introduced to Ratifa, a "real" princess and the park's manager, and is asked to be the acting manager of this "disappointing amusement park in the Tokyo suburbs." This will be the first time since Hyouka in 2012 that KyoAni will be animating a project based on a third-party work. During the last CTFK 2013 there were some rumors that Yasuhiro Takemoto would be directing a project for the studio this year (2014) and it's pretty plausible that said project will be Amagi Brilliant Park, since he has worked with Gatoh in 3 past projects Full Metal Panic? Fumoffu, FMP! The Second Raid and Hyouka (Tamekoto as Director and Gatoh in charge of Series Composition). If getting the game in English isn't enough Atelier for you, this week Dengeki Magazine has announced that the anime adaptation for Gust RPG Atelier Escha & Logy ~Alchemists of the Dusk Sky~ will be airing this April 2014 part of the spring lineup. The Animation will be in charge of Studio Gokumi (Nakaimo – My Sister is Among Them!, Saki series) and all the main voice actors from the main will reprise their roles. The Anime adaptation was announced during an event to commemorate Gust's 20th anniversary. Is there any place you want to visit because of your favorite Anime/Manga? Which place is it. Is there a game you want to be adapted into an anime? Which and Why?